It’s circle time in Colleen Blackman’s class. Her students gather around the screen to watch videos. But these are no ordinary videos. 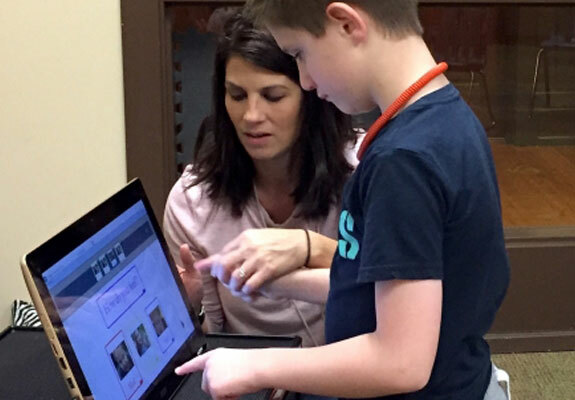 Blackman and her staff are using an online learning platform called “VizZle.” These videos teach important life skills to her class of elementary school-aged children with autism at The Vista School. A catchy song focuses everyone’s attention on the screen. Then an exercise pops up. Blackman calls up a student to find her own picture. Someone else puts the days of the week in order. “How are you feeling?” Blackman asks one of the boys. He walks up to the screen and points to the happy face. Thanks to a generous grant from Andrew’s Gift, teachers across Vista’s Springboard campus are beginning to use VizZle technology for individual and group learning. The technology syncs with Vista’s curriculum and works in tandem with the All-in-One devices recently purchased with generous support from The Vista School PTO and with interactive whiteboard technology funded by the Andrew’s Gift grant. Teachers can either access lessons in the extensive VizZle library or create their own customized lessons to meet the skill levels of individual students. For example, if a student doesn’t know their numbers, he or she can find and match numbers on the screen. Whatever the student finds reinforcing can be embedded, too. Maybe it’s clapping hands or it could be a YouTube football video. “Before, we had to embed so much additional reinforcement to get our kids to participate,” Blackman said. At home, parents can download the VizZle Player app and work with their students on the same customized skills they are learning in school. One of the first VizZle lessons that Blackman and her staff created for each student was an “All About Me” book. The books include pictures of family members and are designed to be fun while teaching vital information, such as the student’s home address.